Jim McCorry's reign as Down manager got off to a losing start as Cavan ran out comfortable five-point winners in Sunday's Dr McKenna Cup Section A game. Down led by 0-4 to 0-1 after 11 minutes but Martin Reilly scored two goals in two minutes late in the first half to help Cavan to a 2-4 to 0-6 advantage. Cavan hit five unanswered points at the start of the second half to stretch their lead at Pairc Esler. Conor Laverty's 55th-minute goal was a consolation as Down lost 2-11 to 1-9. The Mournemen began brightly with points from play from Arthur McConville and newcomer Gerard Collins but Reilly changed the course of the game by converting a dubious penalty on the half hour, and followed that up with a goal a minute later. The harsh penalty decision was awarded against defender Darren O'Hagan on Cavan's Paul Smith and that swung the momentum firmly in Cavan's favour. Reilly's cool penalty into the bottom corner of the net put Cavan in front for the first time and he found the net again a minute later when Kevin McKernan lost a short kick-out. Barry Reilly pounced on the mistake, running through on goal before flicking the ball out to Martin Reilly who sidestepped Down goalkeeper Stephen Kane and buried the ball into the net. Conor Laverty's point just before the break reduced Cavan's lead to 2-4 to 0-6 at half time. Cavan midfielder Gearoid McKieran hit two long-range points with Jack Brady and sub Tom Hayes also on target as their side opened up a 2-9 to 0-6 lead after 49 minutes. Paul Devlin then missed a penalty for Down in the 43rd minute, with James Farrelly diving to his left to make the save. Laverty did find the net for Down after 55 minutes, toe-poking home the rebound after his initial shot was saved but Cavan comfortably held on for an opening round victory in Section A. 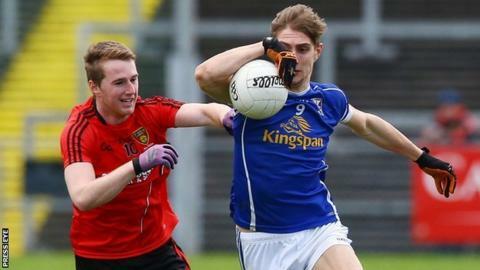 In Saturday's Section A game, Monaghan survived a late comeback from Ulster University Jordanstown to record a 0-20 to 2-10 victory. Malachy O'Rourke's team looked to be coasting when they led by 0-17 to 0-8 with 10 minutes left in Castleblayney. But two goals in three minutes from Derry forward Caolan O'Boyle helped the students cut the deficit to two points. However Daniel McKenna and newcomer Brendan McElroy eased the home side's nerves with late points. Monaghan's full-forward line of Daniel McKenna, Brendan McElroy and Christopher McKenna hit 15 points between them while Tyrone's Ronan O'Neill and Liam Gervin were among the scorers for the students. Monaghan led by 0-9 to 0-5 at half time with Thomas Kerr and Fintan Kelly registering points for the 2013 Ulster champions. They stretched their lead further and the game looked to be over when two Daniel McKenna frees put them 0-17 to 0-8 ahead. Caolan O'Boyle scored what looked a consolation goal for UU when he toe-poked home a rebound after Monaghan goalkeeper Enda Duffy saved the initial shot. The Derry forward hit another goal two minutes later and Timmy Miskella added a point as UU scored 2-1 in a three minute spell, before a couple of late Monaghan points gave the home side the points.